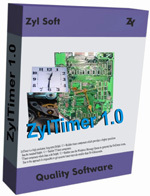 ZylTimer is a high resolution, long-term Delphi / C++Builder timer component which provides a higher precision than the standard Delphi / C++ Builder TTimer component. TTimer component which ships with Delphi / C++Builder uses the Windows Message Queue to generate the OnTimer event. Due to this approach it's impossible to get accurate timer intervals smaller than 50 milliseconds. Qweas is providing links to ZylTimer 1.19 as a courtesy, and makes no representations regarding ZylTimer or any other applications or any information related thereto. Any questions, complaints or claims regarding this application ZylTimer 1.19 must be directed to the appropriate software vendor. You may click the publisher link of ZylTimer on the top of this page to get more details about the vendor.